Jabra has a new wireless headset for folks who work and play while near a mobile phone, which these days is just about everyone. The dual-ear Jabra Sport has all the functions needed for everyday phone use and also doubles as a stereo headset during exercise. 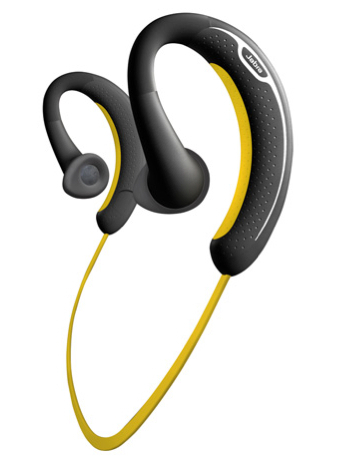 The $99 Jabra Sport will be sold in Apple,(s aapl) Sprint (s s) and T-Mobile retail stores and online at Amazon (s amzn) later this month, while a $69 corded version is already available. For someone like myself who runs every day, usually while listening to music, the wraparound Sport headset holds definite appeal. It meets military specs for dust, rain and shock protection, so it should handle a little sweat with no problem. The A2DP, or stereo Bluetooth, profile is supported, and there’s a built-in FM radio, which is handy for working out without carrying a smartphone. And the company is pairing the Sport with a free download of Endomondo Sport Tracker. That doesn’t mean the Jabra Sport is solely for active users though. The built-in controls and microphone make this headset usable for standard phone calls — as well as for skipping music tracks and adjusting sound volume as needed. After watching the video demo, I was surprised by how much functionality is crammed in the headset. The only downer I can see on paper is the battery life: Jabra says you can expect 3 hours of music time or 4.5 hours of talk time on the Sport. I don’t talk on the phone nearly that much, so these might work for me, but for many, that’s not good enough for an active day of many phone calls followed by a distance workout on the roads. Aside from that, the Sport looks impressive, provided it can maintain a strong wireless signal while on the go. I’ve often had music dropouts with wireless headphones when running, which is more annoying than an untied shoe during a marathon. Kevin, did you end up picking these up and if so, how are they? I did not although I’m hoping for a pair to review. I’m still using my wired Sennheiser MX-680’s for all of my music listening while running.